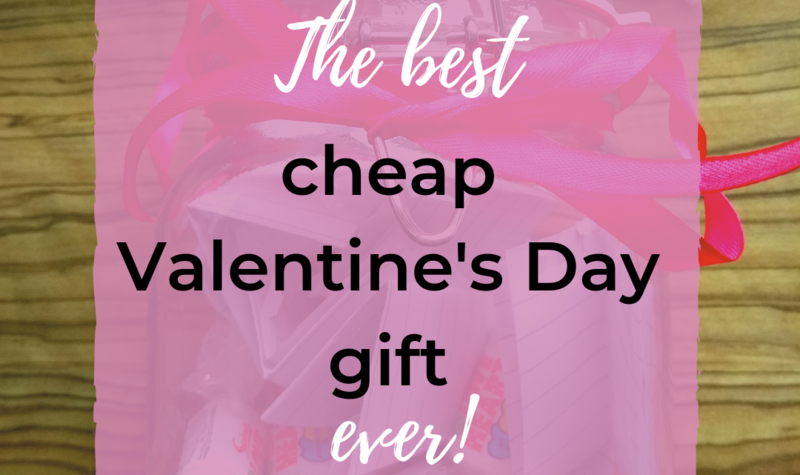 Looking for a cheap Valentines gift idea that’s totally perfect for him or her? In the past, I’ve always found it really difficult to come up with cheap Valentines gift ideas. You want to let your other half know that you care, without buying into the all of the Valentine’s Day hype that makes your gesture seem phony. Many of us are also broke after Christmas, and don’t have an unlimited budget to spend on impersonal Valentines bouquets and overpriced gifts. Last year when we paid off our £16,000 debt, we were more interested in reducing our expenditure than spending £50+ on flowers and chocolates. So I came up with an cheap Valentines gift idea for my other half, and it was such a success that I’m doing it again this year. My cheap Valentines gift idea costs about £5, takes ten minutes to put together and it can be personalised to your partner’s tastes. So instead of panic-buying something expensive and impersonal, why not do something your partner will love? The money saved is just a bonus. 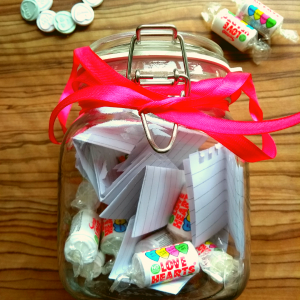 A little jar packed with notes and sweets. In the jar, each note contains a gesture, and your partner can pick these out at random or you can plan them in advance. Every gesture is something you know your partner will appreciate, love or get some value from. My jar, craft ribbons and sweets were purchased at B&M. To make fill my jar, I opted for Love Hearts because I know my partner loves these, and they provide a pop of colour. 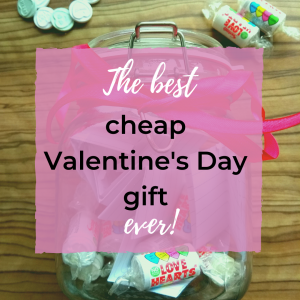 After adding the sweets to the jar, it’s time to turn this cheap Valentine’s gift idea into something really special! My partner and I have been together for 15 years, so I’ve added 15 gestures, and I would adapt this to your own relationship. So pick a number that’s significant to you both; it can be the total years or months you’ve been together, the age of your children, your door number. The number of gestures adds sentimentality and gives your gift and lovely, personal touch. What else can you think of that your partner would love, that you can show them you really care by giving them? Once you’ve filled your jar, wrap some ribbon around it and tie into a cute bow. And that’s your cheap Valentines gift idea ready to give to the one you love! The key to making a cheap Valentines gift idea into something amazing is by adding those sentimental and personal touches. Fill your jar with gestures your partner will love and choose things that are beloved by you both. Even now that we are £1,000 per month better off than when I first came up with this idea, I wouldn’t go back to grander gestures. This idea is just perfect. Happy Valentines Day 🙂 Leave me a comment below and tell me what gestures your partner would love in their Valentines Day jar.